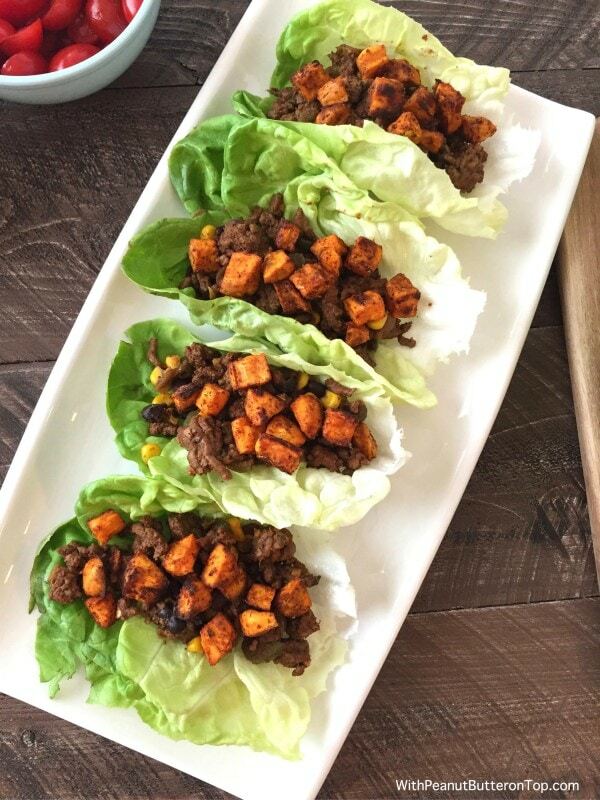 Southwest Style Sweet Potato Taco Lettuce Wraps – a wonderful lower-carb, diet friendly recipe, packed full of flavor and spice- without the guilt. And only 177 calories per wrap! There’s just something about taco’s that just makes my taste buds dance. I could have them any day of the week – not just on Taco Tuesdays. But, of course, I could say that about pasta, pizza, sushi, burgers, french fries… need I go on?? This is my go-to for enjoying tacos, but without the guilt. Not to say that I don’t enjoy my tacos with hard or soft shells from time to time. But being the carbivore that I am, I am always having to tell myself to back off a bit and turn to increasing my veggie intake. I think we all have moments like that, do we not? Ha. With these tacos, I decided to go with lean ground beef for once. Normally I do ground turkey or chicken. 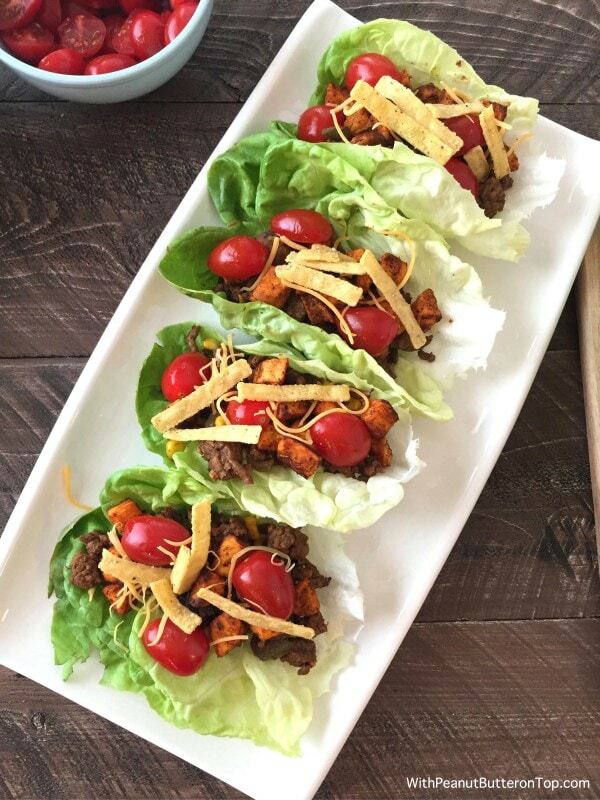 You can do as you please with your tacos. 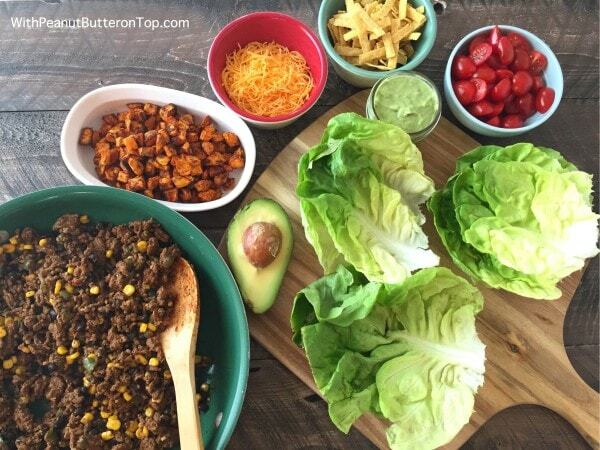 I think the best part of lettuce wraps is the fixing you can layer them with. You can use any type of green leaf lettuce that you would like. I would recommend the larger outer leaves of romaine, iceberg, or boston lettuce (pictured above). 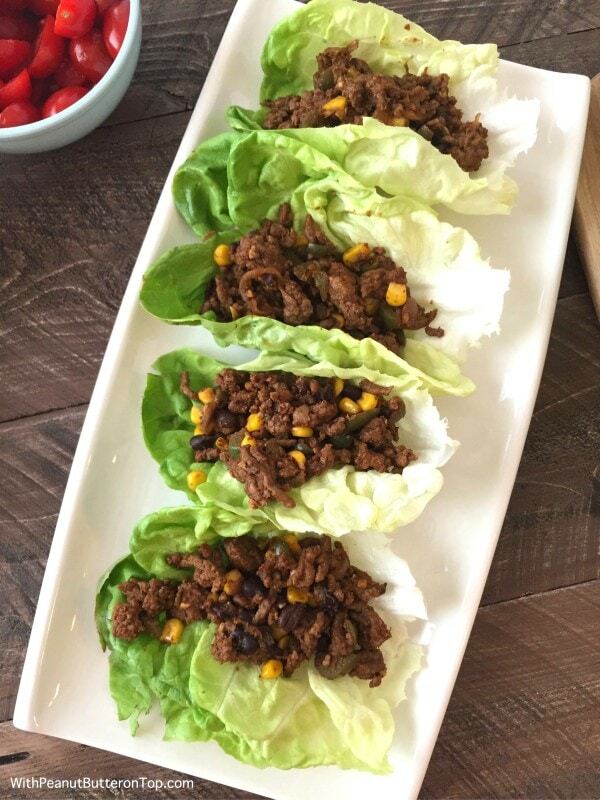 Load up the tacos with 1/4 cup serving of the cooked beef mixture. Don’t forget those crispy Easy Roasted Sweet Potato Bites. 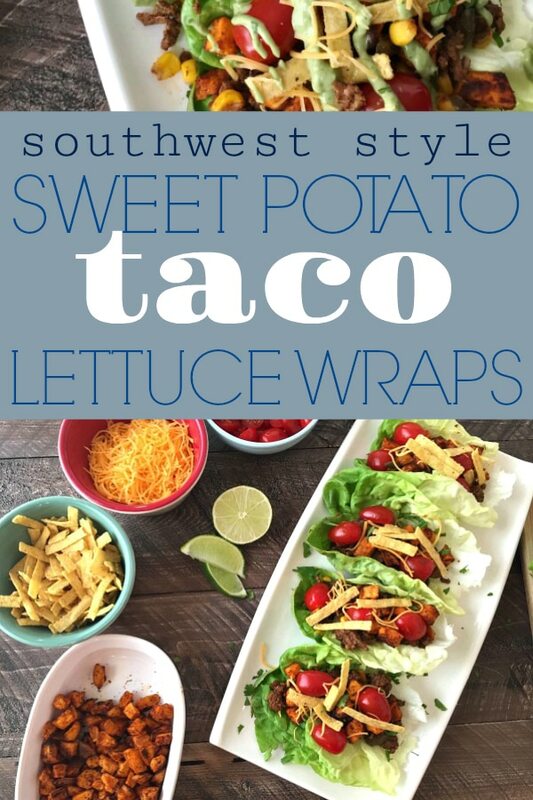 I’m not sure if you’ve had sweet potato in your tacos or wraps, but it is phenomenal. 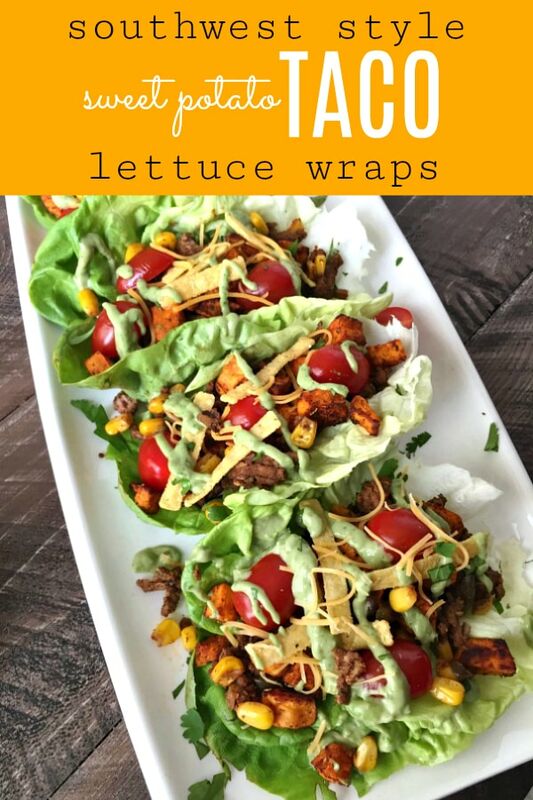 Adds a nice, crispy, yet soft, texture to the wraps. Not to mention a tiny bit of sweetness, much like the corn in the beef mixture. And continue layering! Don’t forget the cheese. That is one of the best parts of a taco, right? Ohhh…. and let’s not overlook the crunchy tortilla strips. You know, for even more of a crunchy texture. 😉 They are completely optional, feel free to omit and stick to meat, cheese, and veggies here if you prefer. Drizzle or scoop on some of the Jalapeño Avocado Sauce and you’re good to mow down! Mind you, this sauce comes with a punch to face in heat to it. So feel free to cut back on the amount of jalapeño used, sub for a pinch of crushed red pepper, or omit completely. The sauce will still be delicious. I promise you! Now, how could you say no to a taco like that?? You will not be missing the hard/soft shells with this recipe. Your taste buds will be singing, your kiddos will actually enjoy their veggies for once, and your spouse will be asking for seconds. Trust me. Best part?! It’s easy freaking peasy lemon squeezy! 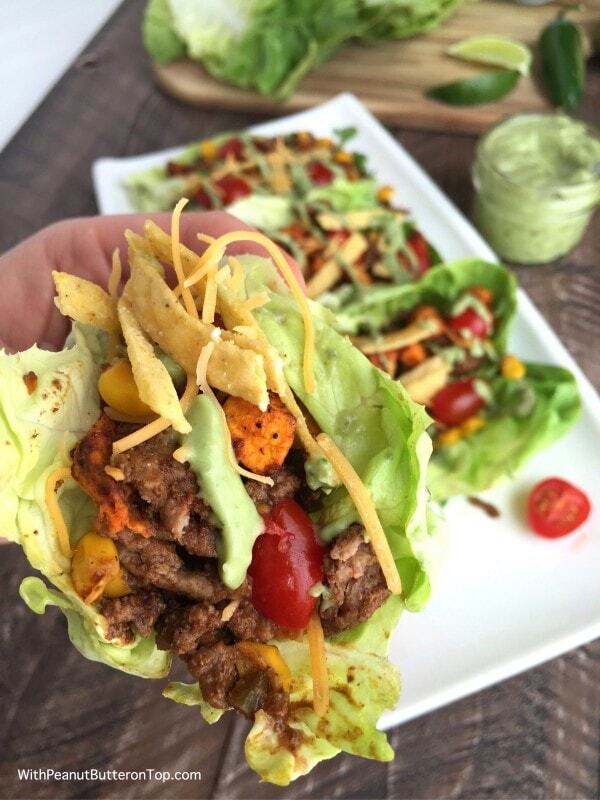 Speaking of which, don’t forget to squeeze a tiny bit of lime juice over your wraps before diving in with hungry fingers! 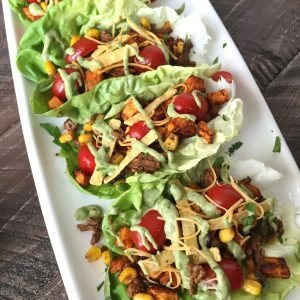 Southwest Style Sweet Potato Taco Lettuce Wraps - a wonderful lower-carb, diet friendly recipe, packed full of flavor and spice- without the guilt. And only 177 calories per wrap! If you haven't already, start with making the Easy Roasted Sweet Potato Bites first. 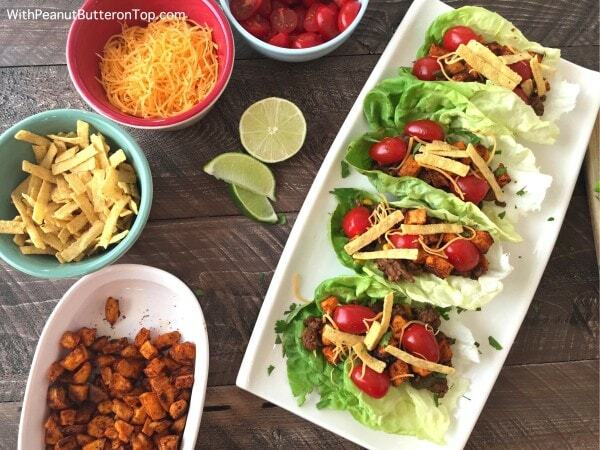 While they are baking, prep your taco mix by chopping the onion, garlic and bell pepper, as well as your garnishments. Halfway through the potato bake time, place a nonstick pan over medium-high heat and heat the olive oil. Once heated, add the chopped onion and pepper. Sauté for 2-3 minutes, or until the peppers have softened and the onion is translucent. Add the garlic and allow to cook for 1-2 minutes before adding the ground beef. Break apart the beef as it cooks. 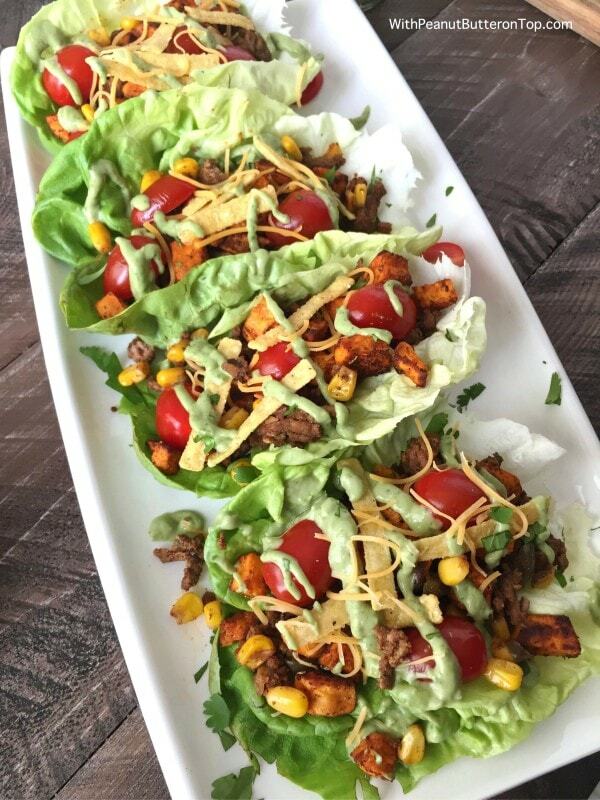 Add the taco seasoning with 1 to 2 tablespoons of water at a time to fully incorporate the seasoning mixture. Add in the corn and black beans to warm. Cook until beef has browned. While the taco mixture is cooking, prepare the Jalapeño Avocado Sauce by adding all ingredients listed into a blender or food processor. Process until it reaches a smooth, creamy consistency. Set aside until needed (refrigerate if it will be a bit before being used). **Used when you add the taco seasoning to help add moisture to the beef and also to thoroughly mix the seasoning in. Amount of water used will be dependent on how watery your mixture already is with the veggies that have cooked down. These look so good! The jalapeno avocado sauce sounds like something I could eat by the spoonful! Is this easy to prepare before hand, or should it be made right when you are ready to eat? I wish I had time to make these today, but I guess I’ll just have to go buy a wrap somewhere until I can make some. Thanks for the lunch inspiration! 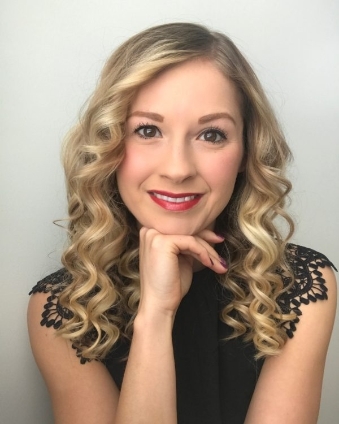 Hey April! Thank you for your sweet comment! It’s a hot sauce, so unless you’ve got a love and tolerance for hot foods, I wouldn’t recommend “by the spoonful”.. aha!! Kidding! Being that the sauce has avocado in it and that avocado, once exposed to air, starts to oxidize and turn brown, I would recommend to eat it with 1-2 days of having made it. Once the avocado starts to turn, it really changes it’s rich, creamy flavor, and sadly, not in a good way! ha. I hope you like this and whatever else you may try! !